MMMMmmm What to do with leftover chicken? Well, LOTS! I had a big craving for Mexican flavors and quesadillas are probably one of my favorite ways to enjoy it. Quesadillas are basically a flour or corn tortilla filled with a mixture of cheese and other ingredients, folded in half. There are so many varieties that it is difficult to get tired of it. This is one of the more complex versions I have made and I think that this version is fast becoming one of my favorites. Plus it is filled with healthy ingredients. Please don’t mind the awkward shape of my quesadilla, I haven’t mastered making my tortillas in a perfect circle yet 🙂 The recipe, however is great! If you want to make your own Flour Tortillas, here is a link to my recipe. 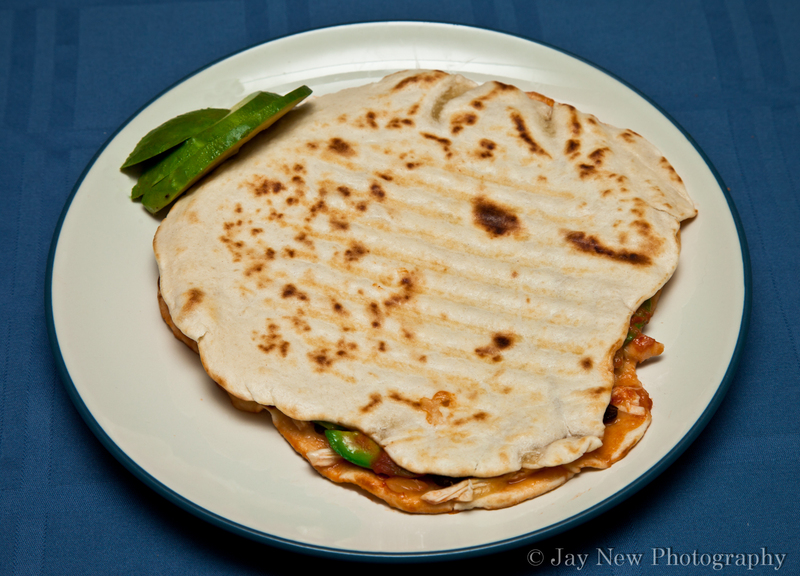 I made mine on my Panini press but you can certainly make this on a frying pan or griddle. Careful not to over stuff your quesadilla, as it will make it soggy and hard to flip. Heat frying pan on medium-low heat. Make sure all your ingredients are prepped and ready to assemble. 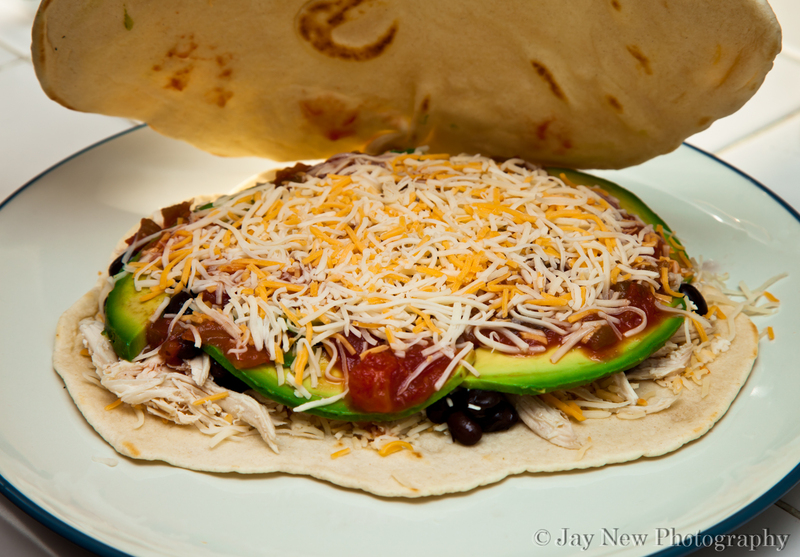 Spread your shredded chicken, black beans and avocado over the cheese. Spread some salsa over the filling and top with remaining cheese. Carefully place quesadilla onto frying pan and cook until the bottom tortilla is lightly browned and some of the cheeses has melted. Remove quesadilla from pan and allow it to cool for about a minute before cutting. Sneak Peak Inside Before Cooking!! Serve with Salsa, Sour Cream, Guacamole and/or hot sauce. I hope you like these!! I loved your Quesadilla recipe too! The versatility of this great recipe is wonderful! What brilliant looking quesadillas. I love that you made your own tortillas – so much better than store bought. I totally agree 🙂 Thank you Mandy! you made ur own tortilla! wow! and what delicious combination of ingredients! Thanks Crustabakes 🙂 I love homemade tortillas. The store bought ones have an aftertaste I can’t stand. Looks fabulous, and I love that you made your own tortillas! Thanks! I love making breads 🙂 Just need to work on my circles. Quesadillas! Oh I love a good quesadillas and this chicken black bean wonder will go well for lunch tomorrow :). Wonderful recipe girl. Mmm I actually had leftovers from that dinner and I ate them cold for lunch the next day….omg it was so good! I tend to eat leftovers cold, especially when it is hot lol. I love the picture of the quesadilla being topped. I think there should be quesadilla topping ceremonies come to think of it.